I like pears, and I like apples, but as a general rule, I don't like either in my perfume. Whether that's because of how they've typically been used — from Donna Karan Be Delicious to Viktor & Rolf Eau Mega to Jo Malone English Pear & Freesia — or because I just plain don't care for the smell, is hard to say. La Belle Hélène, the latest from Parfums MDCI, promised the pears (and the violets) from the dessert Poires Belle-Hélène, minus all the fun stuff calories (vanilla ice cream and chocolate sauce). On the plus side, it also promised osmanthus, one of my favorite floral notes, and the perfumer in question, Bertrand Duchaufour, is responsible for one of the few perfumes with (noticeable) apple that I like: L'Artisan Parfumeur Traversée du Bosphore. Oh, and plus he is responsible for quite a few other fragrances I was willing to pay real money for. So I was looking forward to La Belle Hélène, even though it costs more money than I would ever spend on a perfume. So far. And La Belle Hélène is now my favorite pear, if that means anything. According to Denyse at Grain de Musc, La Belle Hélène grew out of a pear-iris accord that Duchaufour was "playing around with", with the iris replaced with osmanthus. There is still enough iris to give the otherwise-crisp pear a buttery richness, and in the opening, there is a green, iris-y violet. The osmanthus in the heart is not the happy-go-lucky osmanthus of, say, Ormonde Jayne Osmanthus or Parfum d'Empire Osmanthus Interdite. It's warmer, and emphasizes the darker, leathery aspects of osmanthus, but blended as it is here with pear, plum, rose and ylang (among others; see the list of notes below), the overall effect is muted; I would call La Belle Hélène a pear fragrance, but not an osmanthus fragrance. The base is woody-musky and slightly earthy. I hardly notice the anise, but a couple people on MakeupAlley have noted that it ruined the entire scent for them. If you detest anise, beware. It's a charming fragrance. It has a bit of a gourmand character but never crosses the line into the "I'm wearing dessert" category (not that there's anything wrong with that, some of my best friends are in the "I'm wearing dessert" category). Still, it's a good bit sweeter than I like, without any of the "comfort scent" trappings that will usually make me forgive an overdose of sugar; in the end, I liked it but didn't love it. I'd call it a must try for anyone who likes pear, though, or anyone who likes Bertrand Duchaufour, or anyone who has a hankering for the swanky Parfums MDCI packaging. Parfums MDCI La Belle Hélène is available in 60 ml Eau de Parfum, in a glass bottle with ($375) or without ($250) the resin bust. The notes include pear, aldehydes, tangerine, lime blossom, rose essence, osmanthus, ylang-ylang, orris, hawthorn, Mirabelle plum, myrrh, vetiver, patchouli, cedar Virginia, amber, oak moss, white musk, sandalwood and licorice wood. For buying information, see the listing for Parfums MDCI under Perfume Houses. Note: image is each peach PEAR plum.. by Sunday's child at flickr; some rights reserved. Robin: thanks for the review. I like pear sometimes (mainly Goutal’s), but I am always interested when someone is trying something new. This really sounds lovely, so I’ll have to get a sample. So far none of the MDCI’s have clicked with me, maybe this one will. You know, I like Petite Cherie, and although it clearly smells like pear, for whatever reason I don’t automatically think of it as a “pear fragrance”. So maybe LBH is now tied for my favorite pear. Pear and most other fruits work for me when they stick to the more natural (less sweet) aromatic properties rather than treating it like jelly on top of something a little kid doesn’t want to eat. Petite Cherie doesn’t work for me, but it’s not because of the pear. I do like the opening, but it goes wrong for me in the drydown. I do very much like the wet use of pear in Ce Soir ou Jamais edp. And I like that bright green apple in LAP Traversee du Bosphore too – I’d almost miss it if I dind’t know it was there. I don’t wear PC, I just like it when I smell it…yes, it doesn’t smell like jam, and nor does it smell like a body product, which is what most pear scents smell like to me. I have a bottle of Goutal’s Petite Cherie and it was wonderful while it lasted – turned vinegary within a couple years of purchase. This sounds interesting, still eyeing their discovery set, haven’t caved yet – fingers crossed. It is true, PC does not have a long shelf life…best to only buy it if you’re a “signature scent” kind of person that will use it up soon. Same with the body lotion, which is also nice. If ever you want to enjoy Petite Chérie for longer than that, keep it in the fridge. Mine is lasting well there. I find it a very fun, light scent. Perfect for spring. I keep my Petite Cherie in the fridge, too! It seems fine, two years after purchase – very much a comfort scent for me in the summer. Oh no! Your review makes this sound even better than the press releases. Well, I’ll at least try a sample, but there is no way I am forking over that much money for one bottle. Actually, I’ve been ordering more large decants (large for me is 5 or 8mls) of fragrances lately and I find I’m happier with the variety I get for the cost of just one average 1.7 oz department store bottle. This will probably be what I end up doing with LBH. I do think this one is going to find fans. Also beginning to suspect that apples & pears are going to invade niche this year, just as marine notes did a couple years ago. I would say drat to that, as those are two of my least favorite scents… but then again, perhaps it will give me time to catch up on what I’ve already acquired. Ha…that is a good way to look at it! LaMaroc: keep in mind that if you get a sample vial of this and like it, MDCI offers “sample” sets of five or eight 10ml bottles of all their scents. Very reasonable, and very worth the price, in my opinion. La Belle Helene is available as part of those sets even though it doesn’t appear on the MDCI website yet. Oh, that sounds ideal, Joe! Oh, I did not know that! Thanks, Joe. Crossing fingers this one will show up in the 10ml format. Lemming’d me on this one. I’m swooning over Peche Cardinal, so I have a feeling I’ll be tasting pear soon. I like the MDCI packaging (the “refill”). Thanks for the review. The first fragrance I shelled out money for was predominantly “pear”, and while I wouldn’t wear that fragrance now (I was 18! What was I thinking!) 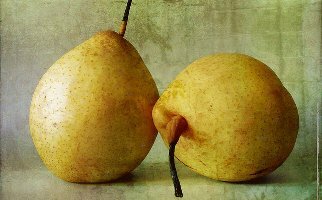 I do have a soft spot for pears. And I love Osmanthus. Jo Malone’s Pear Freesia had me wistful but did not deliver- none of the JMs seem to do that for me- Goutal’s Petit Cherie I didn’t love either, so…… I do hope this delivers, but ack- the price! The price is not so happy, unless you’ve got way more $ than I do. I was badly traumatized by Osmanthe Yunnan (I thought I was going to have to have a skin graft to remove it!) and you further hit my no-go buzz words with pear, licorice, “sweeter than I like” and Duchaufour. Since we’re in basketball season, I’ll say this has “fouled out”! But I do appreciate the interesting and informative review! We are definitely Evil Fragrance Twins. That’s great because I need one! Boo used to be, but lately we have more mutual agreement than not! I think I must represent the intersection of the two of you. I overlap pretty heavily with Robin, but yes, we’ve started finding overlaps as well. Though I love Duchaufour and OY (just bought a little bottle), as well as some licorice… but not sweet and not pear. I received a sample bottle of this from Claude at MDCI. I like it a lot, but I need to continue to wear it to “get” it. But I must say that it is beautifully done. Yes, the sample coffret is not a bad deal at all given the price of the full bottles. And agree LBH is beautifully done! Nothing against LuckyScent, but I have to mention to anyone who’s curious that it is MUCH more reasonable to buy that set (or the smaller set of 5) directly from MDCI. They don’t have an actual retail site: you email them then send funds via PayPal, but it was very easy and no issue with shipping or anything. Seriously, almost half the LS price: ~$125 shipped. Plus you get to pick the ones you want. And get a lovely package from a foreign land. I know Daisy is in the process of getting one. Oh, geez, R. You had me at the buttery pear and the leathery osmanthus… Must try. Now am imagining a perfume for next week’s pears. Will be interested to hear if you like it, A. Thanks for the review, Robin. You describe it perfectly. If a decant appeared magically in my mailbox I’d wear it. But it’s close enough to Traversee du Bosphore (which I adore) that I don’t need both of them. What a relief! Hmm. I am seriously considering buying some of this. Thanks for the review Robin! How is it possible for Duchafour to be in fifteen places at once these days? Next question: When are Turin and Sanchez going to write another guidebook so I can get some perspective on the myriad new releases? You know, since I have no idea which perfumer makes the vast majority of fragrances, I have no idea what the typical number of scents they make per year is. I know in “olden” times, you would never expect to see so much output from one person, but these days, for all I know it’s business per usual. That said, I don’t think it looks good. And I have no idea, sorry! I really love the fragrance of actual pears, almost more than the flavor. I enjoy inhaling the aroma of different varieties, especially Comice and D’Anjou, when they’re perfectly ripe (yes, I sometimes sniff my fruit, usually in private). I find the scent to have really beautiful floral overtones. That’s not to say that that quality often, if ever, translates well into the note called “pear” in perfumery. However, I like JM English Pear & Freesia (though I can see how it might seem shampoo-like) and I should buy some Petite Chérie because I find it great in warm weather. I also enjoy osmanthus a lot, which makes me even more curious. I enjoyed this review, thanks! I love the smell of real pears too, in fact, they’re one of my favorite fruits. But pear in real life and pear in perfume…well, I know what pear smells like in perfume because I was told that note was “pear”, but I’m not entirely sure I would have guessed. Osmanthus is another weird one. The first time I smelled Osmanthus essential oil, I was pretty sure I’d gotten something mislabeled. It’s a very odd smell (you probably wouldn’t guess it comes from a flower), and now I can see why it can go in such entirely different directions in perfume. I have never smelled the real thing! But am told the essential oil is only vaguely related to that smell. I always assume the ‘real flower’ is what they’re trying to capture in the brighter, happier scents like the OJ & PdE. Ten Ren makes a very nice osmanthus oolong…they usually have it in stock year round. There are several grades — the “Osmanthus Supreme” is very good, about $65 for 10 oz. Robin, even when something isn’t your favorite perfume, as long as you find it well made, your reviews make me want to try it in order to see what I find and reflect on what you’ve said about it. BTW, I have that Legendary Fragrances Iris Gris recreation, and the top not is almost holographic pear. It quickly sheds that crispness and the resemblance to pear as it becomes more plush. I wonder if there is a particularly short-lived element of the topnotes that turns the iris-peach (damascone) combination into pear, or if there’s just a shift in the balance between the two. In any case, since osmanthus smells like apricot, I’m guessing it may be functioning as an integral part of the pear accord in Belle Helene rather than a separate complimentary note. I just got my FB of PBH, and love it! Kinda “melancholic” pear, like dried fruit medley with some iris root. Have to admit, thought, that it is the opposite of my most favorite pear ever – Montale Poire, which is getting hard to obtain, but is the ultimate fresh pear champagne – a fragrance of brightness and cheer and none of the “pwittie- fruity” stuff. What a great review I wonder why its so much cheaper than the other fragrances.Perhaps its the notes. I did not know that it was! Interesting. For those of you who were wondering after reading this comment, it is only the “resin bust” bottle that is cheaper (but much cheaper!) Personally, I would never purchase the bust bottle, but if you’ve been looking for one, LBH is apparently the one to get. Luckyscent is backordered until late March. I really can’t wait to try this. Thanks for reviewing. Great article, Robin!! That made me think of a few things… first of all, I love pears. Where I grew up in Poland, pears are a must fruit all year round, but especially in the fall. Here, in FL, it’s almost too hard to come across any pears in our local markets or grocery stroes! Something so usual, typical for Poland, is almost too exotic here! I also adore pears in my perfume… oh well, unfortunately or fortunately I love gourmands. I also, and please don’t laugh at me, adore Victoria’s Secret Pear Glace. When I was 14, and young and stupid, haha, that was MY Victoria’s Secret signature from The Secret Garden collection. Please note that most of my girl friends used to bathe in Love Spell or Strawberries and Champagne. Pear Glace, is suprisingly nicely done. I bought a bottle off Ebay a couple of months ago, just to remind myself my middle skool/high skool years. I was stunned by how nicely it was done, even after all those years! Beautiful floral, with gorgeous violet, and the pear is absolutely NOT dessert’-y, even though I don’t mind anything too gourmand, I really don’t:) Pear Glace is less gourmand than even al the Hermessence all together, and it’s not even niche or anything! The funny thing is, I notice many pear fragrances use violet next to the pear note. Or a cassis note, which is also present in the pear glace. That being said, I can imagine why an iris/violet note has been used in La Belle Helene, and I can already imagine that approach. Now here is a fragrance I am DYING to try, and if it was available, it could even be my blind buy: Poire or now renamed: Poire Sauvages by Montale. Ahhh, my love for Montale never dies:)) I LOVE what Montale does with fruits, I adore when some of his fragrances have that special fruit note, done so well and gorgeous. Lovin pears and lovin Montale, I can keep dreaming on… I don’t see any full bottles available. I think I will order a large decant from the perfumedcourt. I have purchased several 20ml bottles of Montale’s frags on perfumedcourt, but of course when I saw a bottle of Poire, it was already sold. The whole mystery is also the fact that it doesn’t list any other notes, other than the fact it’s a beautiful pear fragrance:) Ahhhh, I’m soooo curious. I will not laugh at you — on the contrary, nice to know that VS does something so well. They don’t always! Parfums MDCI always appeals to me, from its choice of perfumers and the focus on the art of the perfumer (without all the branding and gimieckry of say a Fredric Malle) to the great names they choose – love the opera and literary allusions! Interesting that you see it that way…I see them as more gimmicky, I guess because of the packaging and the high prices. To each his own!